On this episode of RPG Lessons Learned: Dusty asks the guys to help lay out the next campaign, just like writing a mystery novel, starting with the last page. RPG Lessons Learned 062 – What were we expecting when Dusty said that he wanted to play Dungeons and Dragons? 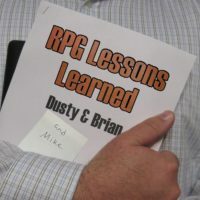 On this episode of RPG Lessons Learned, Brian and Mike are left behind when Dusty goes on vacation to soak in some rays at the beach. With Dusty gone, the guys ask themselves what were they expecting all those years ago when Dusty said that he wanted to play D&D? On this episode of RPG Lessons Learned, Dusty, Brian, and Mike discuss their upcoming campaign, which will be our attempt at running an Actual Play Podcast. For academic purposes, of course.